DESCRIPTION: Notice the black bands below the mouth. 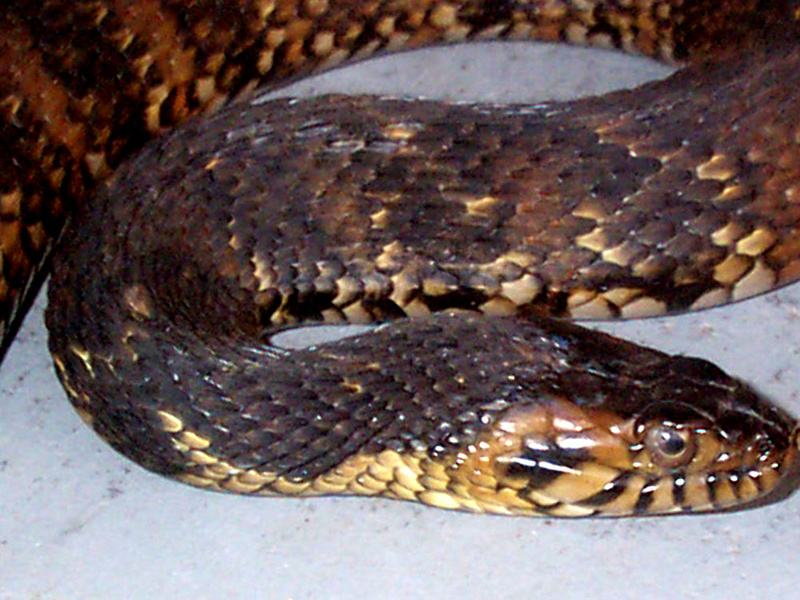 Banded water snakes range from two to four feet in length and range from light brown to black in color with black bordered bands across their back. They are semi-aquatic and have thick bodies. The banded water snake lives in the Florida panhandle, along the coastlines northeast to North Carolina, and in southwestern Alabama. They will exude an unpleasant musky odor and bite if startled. The banded water snake loves fresh water habitats and feels at home in almost any of them like marshes, streams and ponds. They enjoy sunning themselves on logs and are comfortable on branches that hang over the water. Banded water snakes hunt in shallow water for prey like frogs, fish, crayfish, and salamanders. They breed well both in nature and in captivity, bearing up to 40 live young at a time. Their natural mating season is in the spring and their young are born in the summer. The young are brightly colored and generally about 8 inches in length. Since they do live around fresh water sources, it is likely that you will see one if you are sunbathing, swimming, or canoeing. It is important not to panic on land or in the water. If you are in the water swimming, move away carefully and do not yell. You do not need water getting into your lungs. If you are canoeing and you see a banded water snake swimming toward your boat calmly smack your paddle against the water’s surface to scare it away. Again, do not panic. You may flip your canoe and send everything in it, including you, down river. If you happen to see a banded water snake hanging in a tree or sunning on a log while you are sunbathing, leave it alone. It will not bother you. If you have people with you and you feel confident that they will not harm it, let them know; however, if you do not feel good about telling others just leave it alone and do not tell them unless it comes closer.